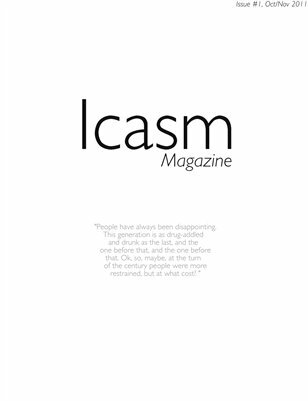 Issue #1 of Icasm Magazine featuring interviews with author Abigail Tartellin, musicians Alex Winston, Chase the Enemy, Clara Engel, Forms Grant Olding and Laura Hocking. Kirsty Dewhurst explains why Mechanical Bride is one to watch. Aida Amoako interviews Miriam Elia and Yasmeen Khan explores the work of photogrpapher Charley Murrell. This issue also features short stories and prose by Brandon Seager, Jen Considine, Rosie Fox, Holly Standfast and Dannyell Rowlinson, poetry by Mark Sforza, Isabella Steel, Hannah Sharland, Zara Anne-Sowah, James Price and Peter Wysocki.